Our children often imitate us, it's how they learn. Sometimes I worry about what they'll learn from me, it's impossible to be how you want to be around these little people all the time. When I loose my temper or shout I often wonder what they have just learnt or how I could have handled the situation better. Days later I might hear them use a phrase and think to myself that's not what I want them saying or thinking. But then there are times when I think that they see and copy something really positive. This morning is a perfect example of that. I help run our local playgroup on a Monday, my son comes along and helps set up and pack away whilst playing with his friends. Part of the routine is we put out snack for the children and then they all sit round and whilst they're eating I read them a story that I bring along. 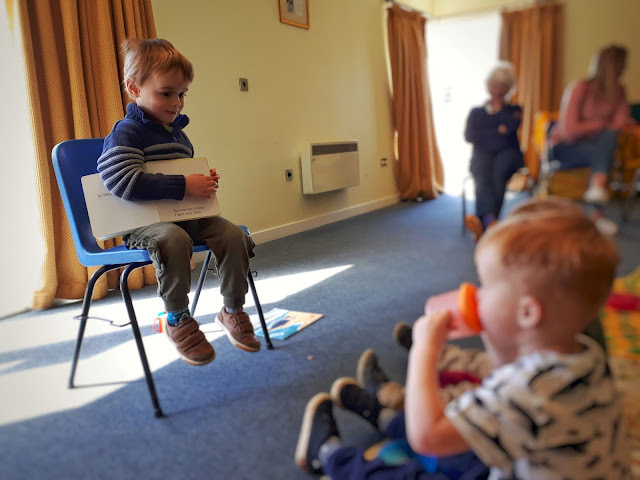 But when I finished today I went to take something back to the kitchen and when I came back my son was sat on my chair, in front of all the children, with a story book that we was "reading" to them all. I was so proud of him, my heart melted a little bit! Such a strong little character, I know he'll go far. Wow, that has made my day... What a confident and caring thing for him to do. He can be at time, although he's only three so it's on his terms! It was lovely and lots of gushing mum's thinking he was cute. this is the best thing i've heard in a long time. It was lovely, a really nice moment. A chip off the old block? Haha, at times! He'll be a better person than me, of that I'm sure. I am proud of you too. Yesterday my daughter posted a picture of a dad reading to my 18 month granddaughter and his daughter. Apparently the dad walked in to take mum and baby home when Mia walked up to him and gave him a book. She sat down and he read to both little girls. The gift of reading is special. However, a man who will follow a child's lead and show how a man can be strong and gentle at the same time is exceptional. That's so cute! I love reading to children, one of my favourite things to do. It's been great now my own daughters are older that I can pick some more interesting books to read, we've been having some great fun reading Roald Dahl lately and they've both got into it, although we did have to stop reading "witches" as my younger daughter found it a bit fearful just before bed.